(above) Katherine with 5-year-old daughter, Gabrielle. (above) An iconic Castiglioni Arco lamp drapes over a Charles sofa by B&B Italia in the living room—next to a Brody Condon modified computer game of Elvis gyrating against a hot-pink background. Another Saarinen table rests in front of a Warhol Camouflage print in the breakfast nook. (above) "In the library, two soft-purple Arne Jacobsen egg chairs face each other, next to another (Brody) Condon creation—this time, of Timothy Leary’s pal Baba Ram Dass." 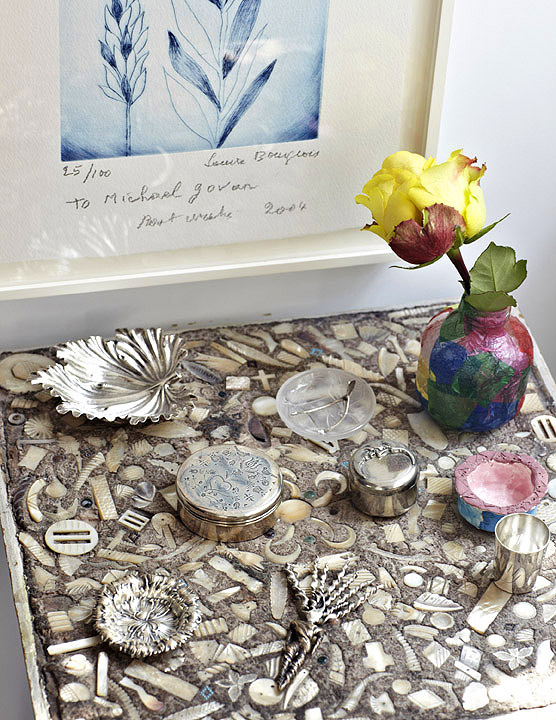 (above) "A folk art wedding table is adorned with sacred objects: a miniature jewelry box from when she was born; a silver wishbone from her dear friend Sandy Hill; a papier mâché vase made by her 5-year-old daughter Gabrielle." The family initially vowed to hang only one artist in each room. “It’s about being minimal and specific,” says Govan. (above) "Whether cocktails for 100, an artist’s lecture or a quiet dinner for 18, Govan and Ross needed a large, open kitchen that could accommodate caterers, plenty of storage and a backyard that could be tented." For more eye candy (and the full article), click here. All words and images via C Magazine. Hi Louise, what a GREAT, great house! Love the Arne Jacobsen Chair-image!! I like the saying about seeing more, not less. And what fun to have huge balls like that in the lawn! What's up, its fastidious article about media print, we all be aware of media is a fantastic source of facts.